This is what Christmas is like in Southern California. It’s about 70 degrees and the cats are frolicking in the backyard. Inkblot is up on his favorite fence, entranced by the sight of birds he’ll never catch. 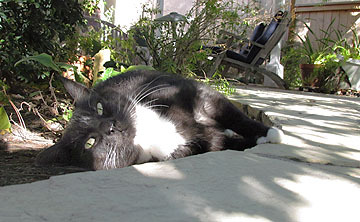 Domino is down in the garden, rolling around on a spot that used to have a catnip plant and perhaps still retains a bit of feline allure. Need more cats? 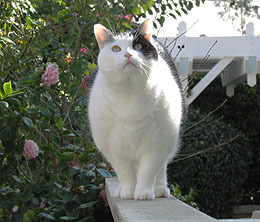 BuzzFeed has ’em: The 30 Most Important Cats of 2011. It’s obviously missing a couple of pretty important cats, but I guess even superstars have to make way once in a while. Still looking for some last-minute gift ideas? Here’s a couple of thoughts. Click here and you’ll get a list of MoJo’s favorite books of the year. There’s bound to be something there for that hard-to-shop-for loved one on your list. Or click here and give someone a gift subscription to Mother Jones. It’s only $9.95 for six issues. At that price, nobody needs to be a grinch this year.